As a mother, it’s our duty to provide our babies with the best nutrition possible. We are all busy in our lives and how easy it would be to finally have some healthy homemade drinks, that provides everything that a kid needs to grow into a healthy and strong adult, wouldn’t it? But are these health drinks truly healthy? Are the claims made by these health drinks true? Pick up the boxes of these health drinks and read the ingredients. The first ingredient is the dominant one followed by the second and so on. The dominant ingredients in most so-called “health drinks” are Malt extract or Malted barley, sugar, liquid glucose, wheat, soy, vegetable oils. If you are looking for homemade protein drinks for your kids, you can take a look at this article. If you compare the ingredients of these drinks, you will realize that you do not need this highly addictive sugary fat filled powder to be added to a healthy glass of milk. 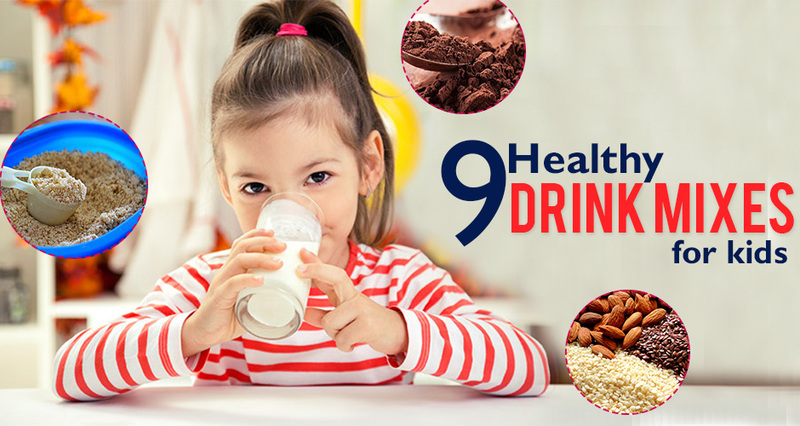 In simple words, these “so-called health drinks” mainly consists of- Grain, sugar, processed junk, artificial vitamins & minerals which are difficult for kids digestive system to absorb. Even the proteins it contains is low quality with lots of preservatives and salt. Malt extract is made from grain and has the same effect as refined sugar. Main carbohydrates in malt syrup are Maltose that has very high glycemic index even higher than table sugar which will likely not have a gentle effect on your child’s blood sugar levels. It also results in cavities and tooth decay. So then what is the solution? You didn’t think we’d leave you in the lurch, would we? Of course we are going to give you the recipes for the easiest and healthiest homemade protein drinks for kids. The benefits of almonds are known to every mom! 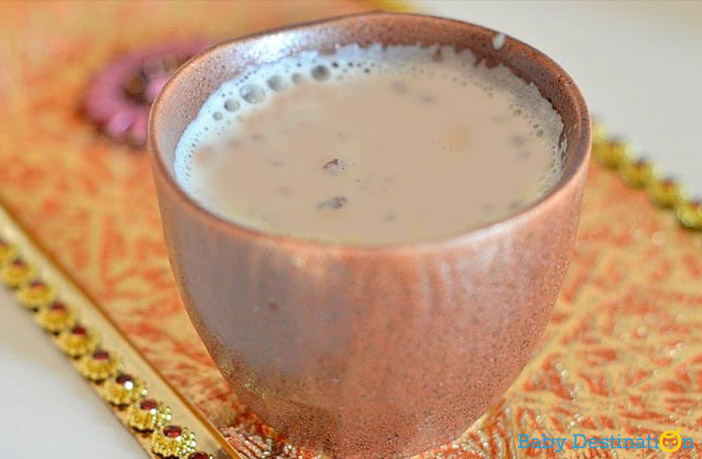 What makes this recipe special is that it combines the goodness of almonds with the taste of chocolates! Win-win for moms and kids. Roast and blend Almonds to a fine powder. Add unsweetened 100% cocoa powder to it. Add as required to a cup of milk. Sweeten it with honey, jaggery or shakar (sugar from jaggery). 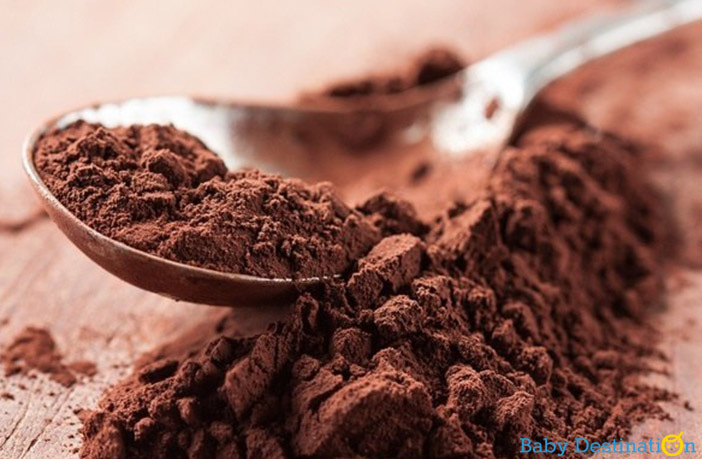 Use the following recipe to make healthy and delicious dry fruit powder for your baby. Dry nuts: equal quantity of Almonds, Cashew nuts, and Pistachios. Soak the Almonds in hot water for 5 minutes. Then drain the water and rinse almonds with cold water. Take out the peel. Pat dry with a kitchen towel. Keep it under the fan till they are cool and dry. In a preheated wok, dry roast all the nuts separately. Just roast them till they are warm and not for too long or they’ll start releasing the oil. It should take 10 to 15 seconds at max if the wok is hot. 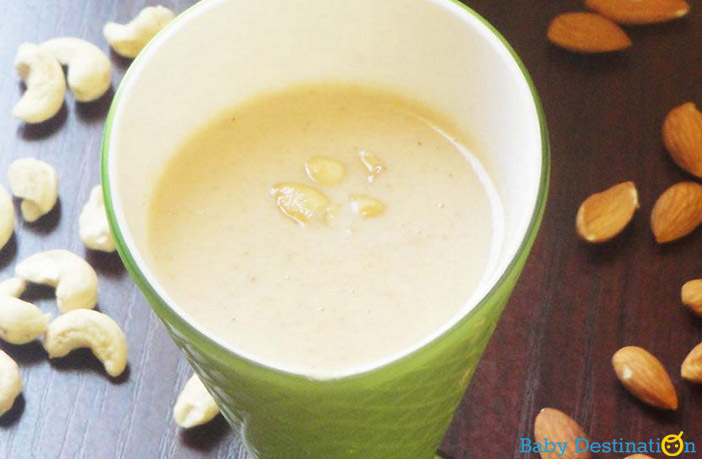 In a blender, add all the roasted and cooled nuts, saffron strands, cardamom powder and shakar. Set your blender setting to pulse and pulse for no more than 10 to 12 seconds. Now with the help of a soup strainer, sieve the powder with the help of a spoon/ spatula. Collect the hard particles and pulse again in the blender for 10 seconds. Sieve and collect the remaining hard particles and pulse again. You have to do this a couple of times. Now put the fine Dry fruit powder in an airtight container and refrigerate it. It will stay good for 2 months. Use as required. 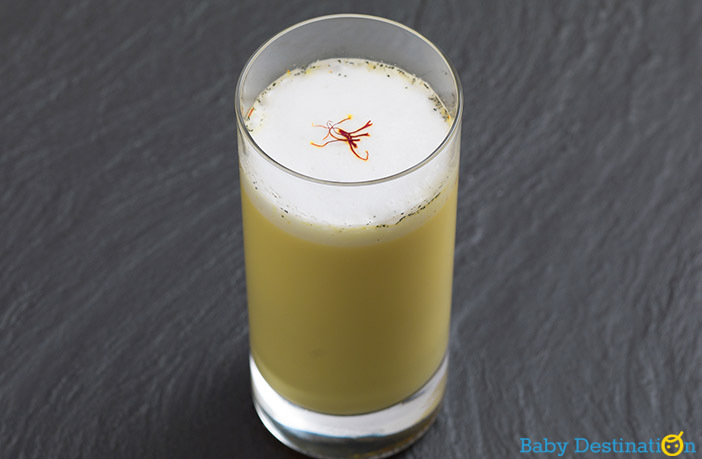 Your kids will love this healthy drink, this winter. It has the goodness of raisins which are enriched with anti-oxidants, dietary fiber, Iron, Calcium and Vitamin B complex. It also contains saffron which not only enhances the taste but Saffron is great natural antiseptic and contains powerful anti-oxidants. Saffron contains minerals like manganese, copper, potassium and also stimulates digestion. In a cup of milk, add a tbsp of oats (it makes more fulfilling and nutritious). Along with that add a pinch of cardamom powder and few strands of saffron. Mix in 1/2 tsp of jaggery or honey. Switch off the flame. Then add 5 to 6 raisins. Cover it and let it stand for ten minutes for raisins to soften. Then blend it all in a blender and serve. 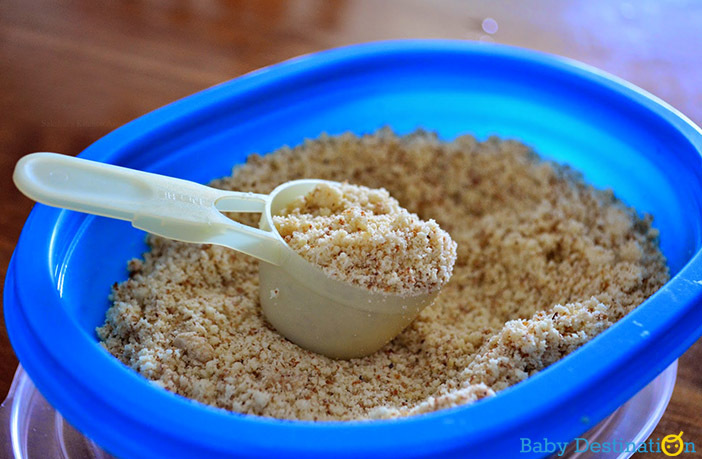 If you are bottle feeding your child then you can sieve this with a soup strainer to get rid of the grainy part. Making dates syrup at home is super simple. Though there are a lot of date syrups available in the market. nothing beats homemade stuff. This dates syrup recipe will come out extremely delicious and will taste so much better than the store bought ones. Dates are an amazing source of nutrition. They are full of iron and minerals like calcium, potassium, folate, Vitamins, fiber and much more. Dates also help relieve constipation, strengthen bones because of the mineral found in dates. The high content of iron in dates helps to balance iron deficiency which is quite common among kids and adults. And mothers – a bonus – it also helps in healthy weight gain!! So, give white sugar a skip and use it as a natural sweetener for your baby’s porridge, milk, and milkshakes. Use it on pancakes, on toast, add it to cakes. Basically, anything you like. 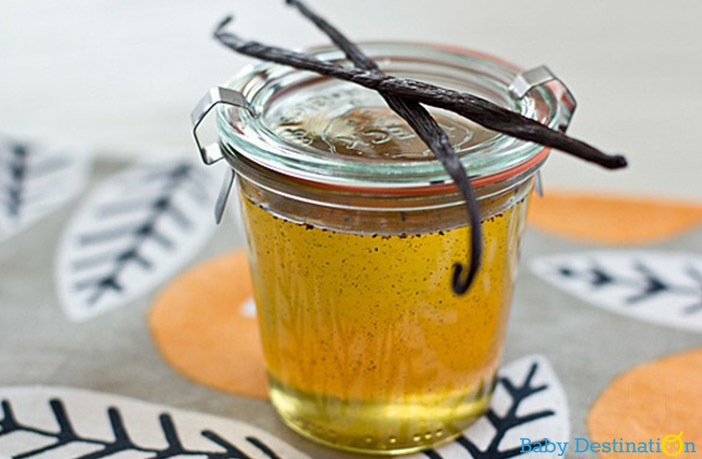 Vanilla Bean extracts: from one bean or 1 tsp pure Vanilla extract. Put the chopped dates in a heavy bottom pan and pour enough water in the pan so that the dates are submerged completely. Bring the water to boil then switch off the flame. Add Vanilla and mix. Let the dates sit in hot water for some time till dates become soft and tender. It took me 20 minutes. Strain the water and mash the pulp a little with a spoon. Put the dates in a blender. Add some dates water and blend it all to form a smooth puree. Strain the puree. Add more water if required so that liquid is runny. Put it back on the stove and cook till thickened. It’ll get thicker ones cooled. Store it in the refrigerator in a glass bottle. It stays good for about 2 weeks. Note: Dates are suitable for 8+months babies but do consult your pediatrician before introducing anything new. Here’s how you can sneak in a bit more health in your child’s favorite milkshake. Make the most of these seasonal gorgeous orange carrots that are loaded with Vitamin A. The yummy taste of mango will camouflage the taste of carrots. So your child will get the taste of regular mango milkshake, without being aware of the extra nutrition you managed to sneak in! 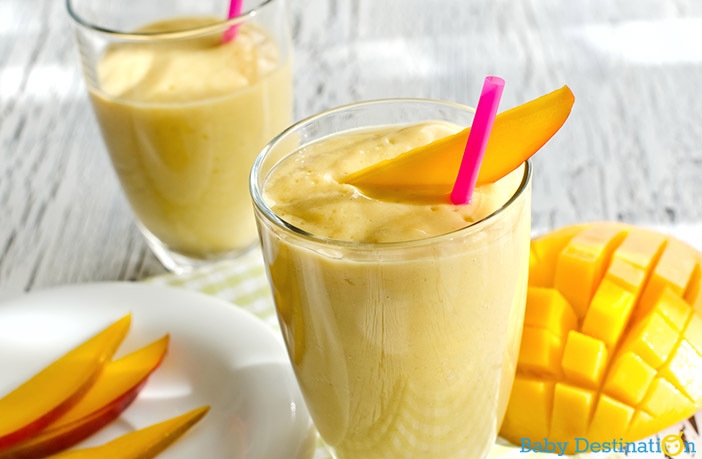 In a blender, add 1/4th cup chopped mango. Grate half a carrot. Add a cup of milk. Flavor it with some pure vanilla extract and blend well. Strain with a soup strainer, if your baby is bottle-fed. You can also add some flax seeds but that’s optional. Note: Suitable for 1+year old kids. For younger ones, you can try this in breast milk or formula. Poppy seeds or khus Khus is an important herb in Ayurveda used to treat various health conditions. One tbsp of poppy seeds has 45 k cals and it’s also a good source of calcium, iron, copper, zinc, manganese, potassium and magnesium. These seeds are also a good source of Omega 3 and dietary fiber. And it is an excellent source of B-complex vitamins. Poppy seeds paste has been known to cure diarrhea and regular consumption of these seeds helps cure asthma and cough. Soak a tbsp of poppy seeds, 4 almonds, and raisins in water overnight. Drain the water with the help of a strainer and peel the almonds. Bring a cup of milk with cardamom to boil. Meanwhile in a grinder, add some milk, khus khus, and dry nuts. Blend it well. Then add rest of the milk and blend again. Add sugar if required. Raisins will make it sweet though. Note: If your child is bottle fed, then strain it through a soup strainer. Don’t discard the residue after straining it. Eat it! Mommies need nourishment too!! Don’t you just love the flavor and the appealing orange color of carrots in milk? Makes it quite appealing for babies too!! Orange carrots are even more nutritious than red carrots because these have more beta-carotene which is converted into Vitamin A. Put kesar strands in warm milk for 5 mins. 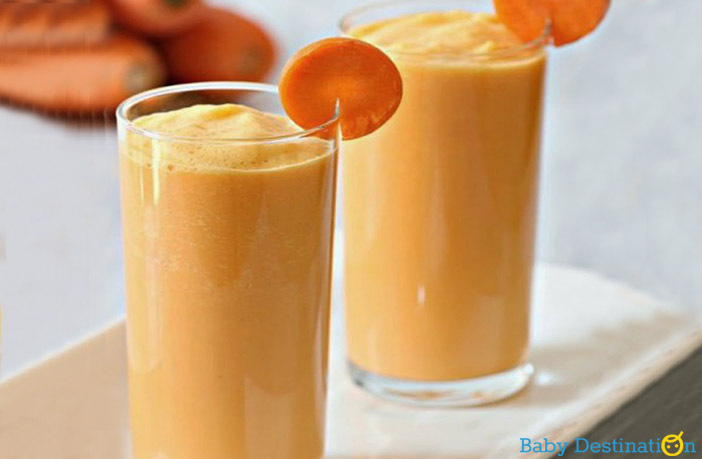 Blend all the above ingredients including kesar mix till carrot is well blended. You can sieve this with a soup strainer for bottle-fed babies. Growing kids need loads of energy. It’s a big challenge for mommies to ensure, there is never a dull moment. 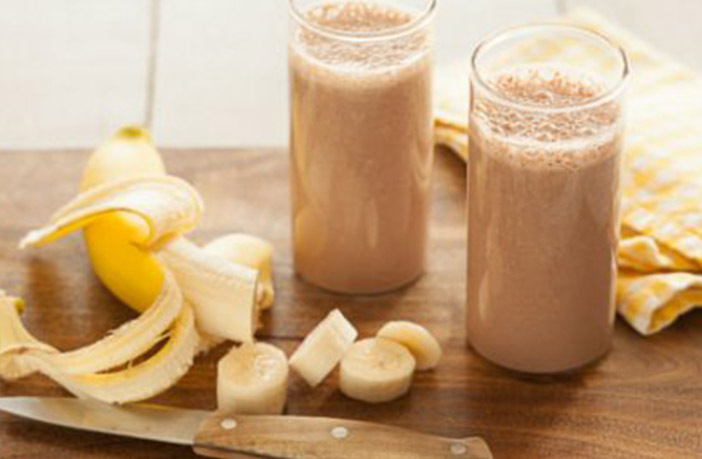 Peanut butter is high in proteins and nutrition packed bananas makes a great energy drink for your munchkin. In a blender, add one tsp peanut butter, half a banana, one cup milk, one tsp or 1/2 tsp honey and a pinch of cinnamon. Blend on high and serve. Note: In case, your child is not bottle-fed, add 1/2 tsp of ground flax seeds. You can also make the same thing with apples. Just replace banana with half apple. Makhana are rich in potassium, proteins, and fiber and very healthy for babies. Dry roast some makhana seeds (also known as fox nut seeds) and grind them to a fine powder. Add 100% unsweetened cocoa powder to it. Sweeten it with honey or jaggery. There is no food that is as nutritionally dense as real food. If your kid is a picky eater, train them to eat real food. Don’t let those stupid ads play on your mind and heart. What do you use to ensure complete health for your baby? Have you tried any of these recipes? Share below!